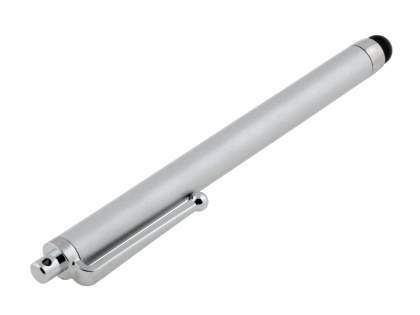 This simple, portable stylus is just what you need to get more out of your phone. The black rounded-tip end is the stylus, and is crafted from a special rubbery material that's effective yet gentle on your touchscreen. 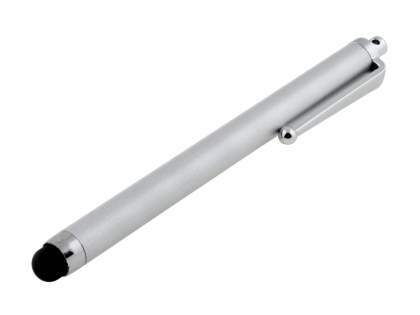 This stylus is specifically designed for use with 'capacitative' touchscreens - that is, touchscreens that are designed to be used by a finger, and on which normal pens and styluses won't work. The stylus glides over the touchscreen, and can be used to tap, type, draw, write and play games - just like your finger, but with greater precision and no oily, annoying fingerprints. And if they also have 'capacitative' touchscreens, it can be used on other touchscreen devices as well - it's 'universal'. This accessory is stylish, lightweight and available in a range of vibrant colours for the casing. And it's portable, its convenient size demonstrated in comparison to a coin in the photo, so it's the perfect accessory to slip in your pocket and bag, ready to be used at any time.